A quick one hour evening flight from Malaysia took us to Indonesia and the island of Sumatra. 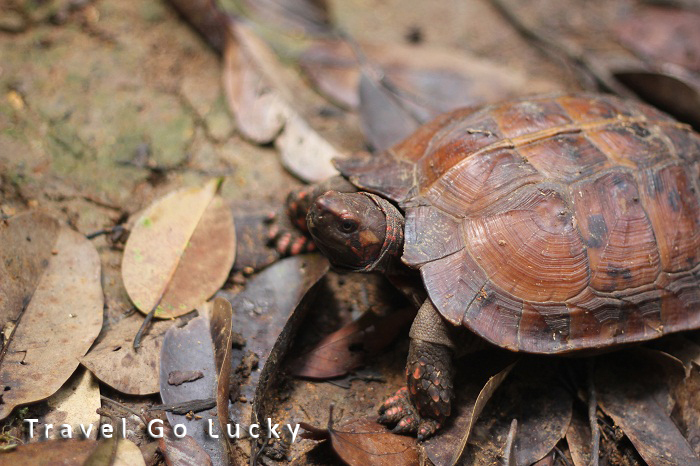 We landed in the large but underwhelming city of Medan, and took off on a four-hour bus ride the next morning to the tiny village of Bukit Lawang. While the the price of the bus ride was unbeatable (US $3), the blaring Indo-pop music was worthy of at least a free ride for everyone on the bus. It was so loud that even trying to listen to your iPod was pointless. 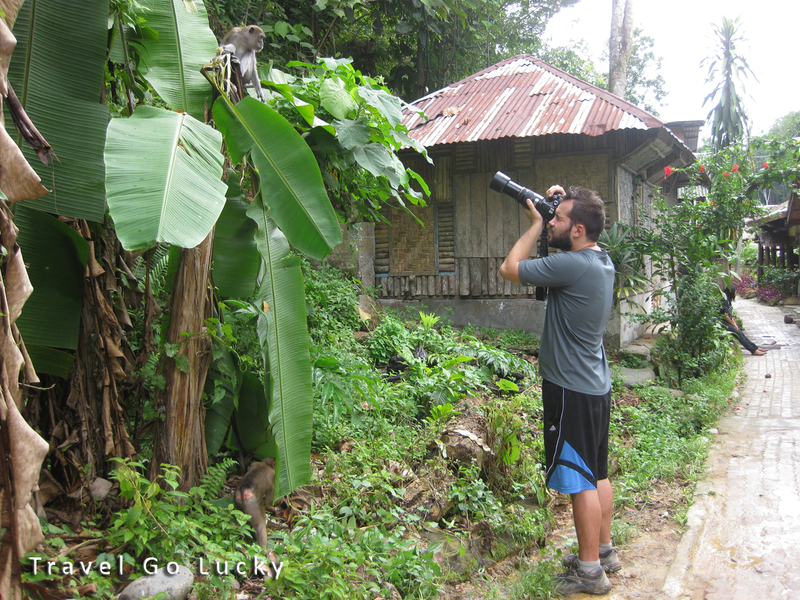 The little village of Bukit Lawang was located just before the entrance to Gunung Leuser National Park, a tropical rainforest one of the two places in the world to trek and see wild orangutans. 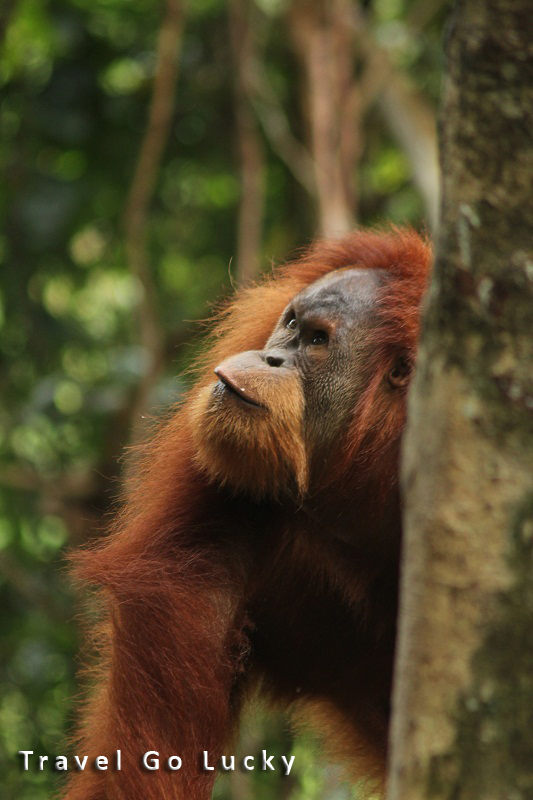 We originally had no plans to come to Indonesia, but decided to make a last minute change to our itinerary after reading about the orangutans. Our first full day we just hung out in the village and made plans to hike in the rainforest. The guesthouse we stayed at was one of the most memorable of the trip, overlooking the Bohorok river that flows through the village, with what looked like a wall of steep jungle on the other side. 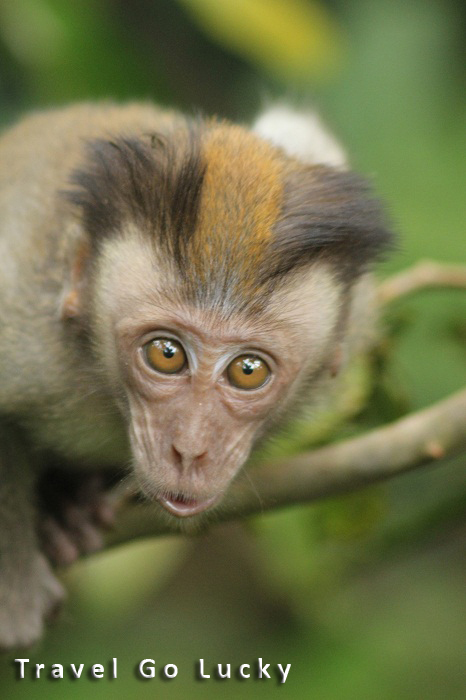 There were monkeys outside every day, either on our porch, or across the river. 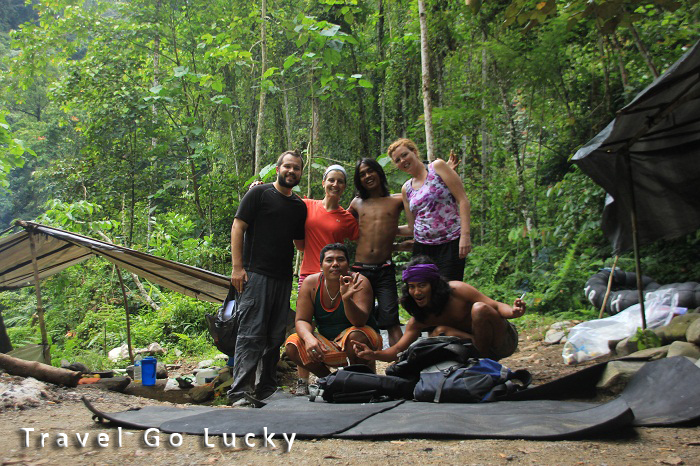 Our second day was the first of a two day trek in the Sumatran jungle, which also happened to fall on Thanksgiving. This was definitely going to be an unforgettable holiday experience. We started the day with our guide Kembar visiting the orangutan feeding platform, where guides sit on a wooden platform and give any orangutan’s in the area bananas. 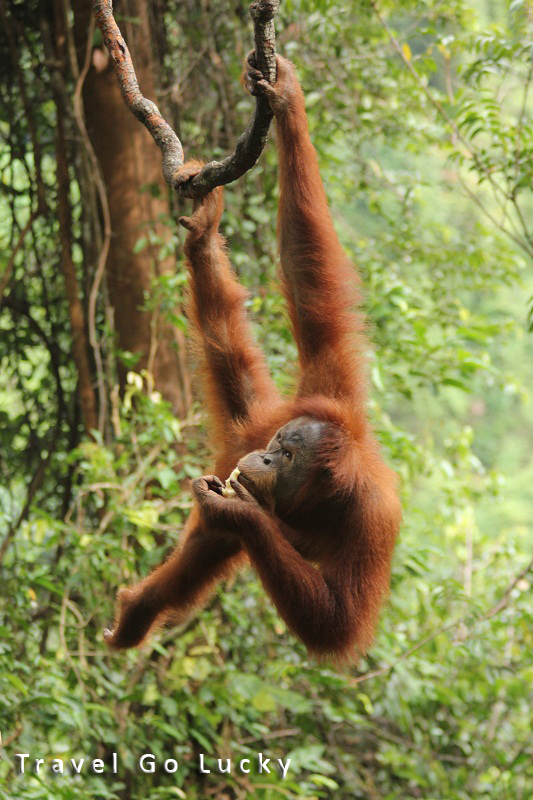 It used to be a dedicated area to rehabilitating orangutans that were reintroduced into the wild after being found as pets, but has since changed into an area where they can keep an eye on rehabilitated orangutans by offering a free meal. A decent number of female orangutans came with their babies on back and a few males would show up as well. 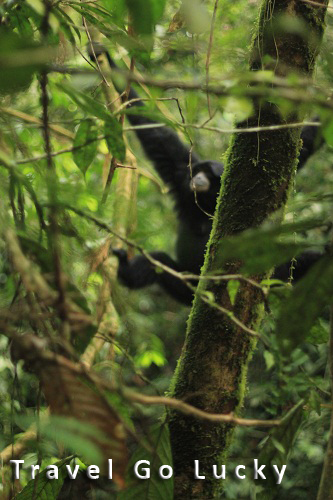 A few interesting facts about these magnificent primates are that they are the largest living animals to reside in trees, have longer arms than the other great apes, and that they are among the most intelligent primates, using a variety of sophisticated tools, also making sleeping nests each night from branches and foliage. Watching these beautiful creatures was breathtaking. You could tell one was coming because the trees would start to shake. 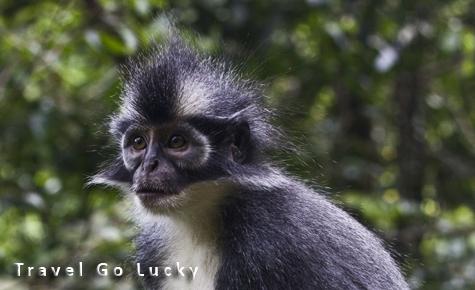 Adam and I also saw Thomas Leaf monkeys, aka “mohawk monkeys”, who have the best haircuts of any animals we’ve seen so far. 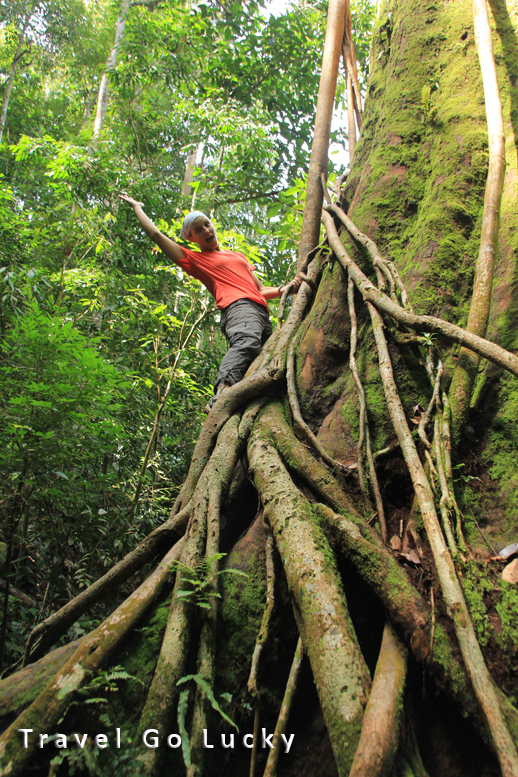 After viewing the orangutans in action, we started our journey deep into the jungle. With it being a rainforest the ground was a little moist and slick. There was no easy path for us to follow, weaving in and out of vines and trees and up and down steep hills. 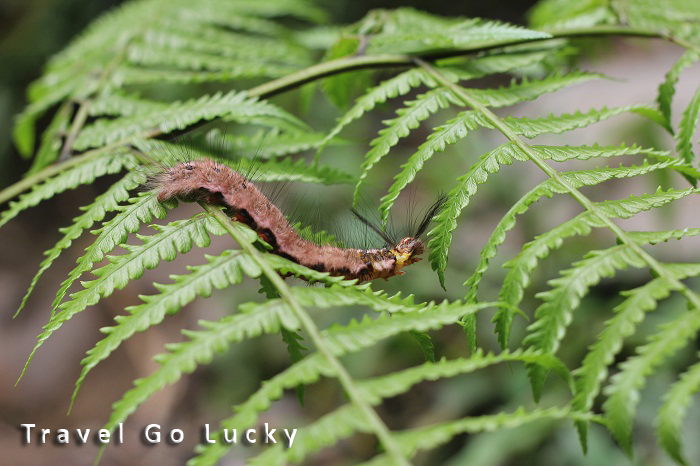 Along the way we saw many gigantic ants, almost about the size of a US quarter, centipedes as long as 6 inches, brilliant colored butterflies and a turtle in the middle of the jungle. We spent about 5 hours hiking and took a few breaks to catch our breath. Halfway into the hike we got to see three wild orangutans hanging out in the trees above us. One almost peed on Adam, he only missed by a couple fo feet. That was hilarious. 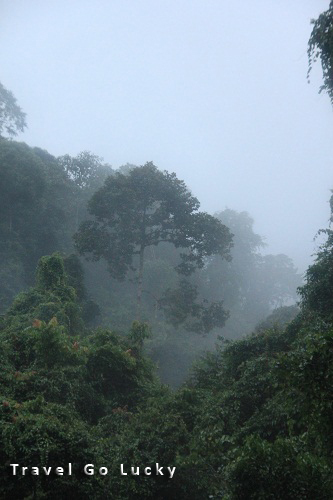 The humidity in the rainforest was insane. It made Florida feel like a desert in comparison! We ate lunch near a waterfall in a little valley that looked like it was straight out of the movies. 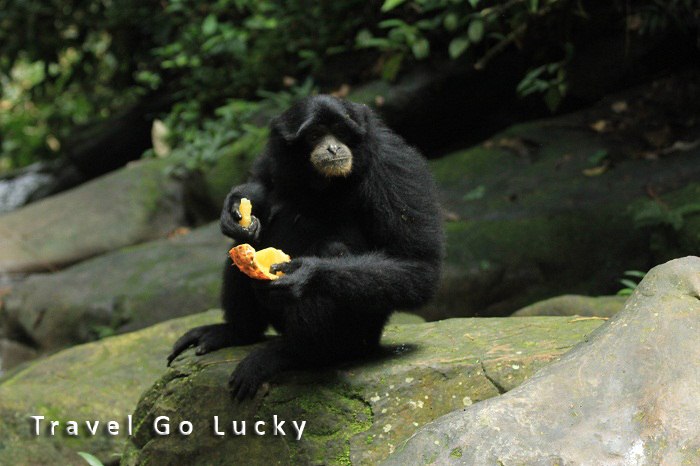 After we were just about finished eating our lunch Adam looked over his shoulder and noticed about five large black monkeys eyeing our food. It was shocking at first because no one noticed them at first. 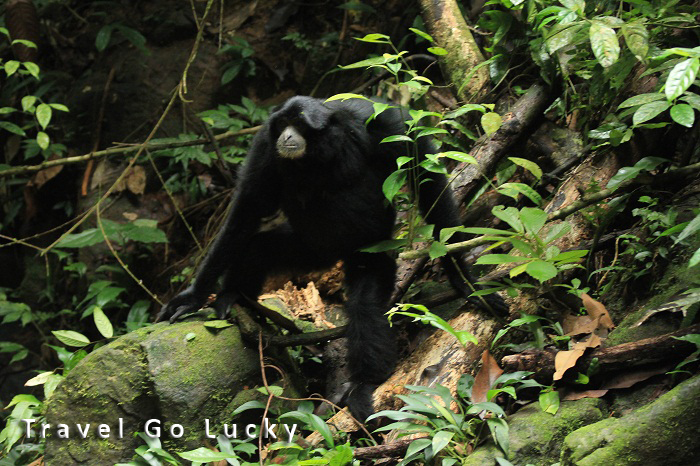 Kembar informed us that they were called black gibbons, a critically endangered species. We spent about a half hour with them as some continued to peer down at us and others wanted make away with some scraps of fruit. They were pretty determined to not leave empty handed and got some pineapple from us before we continued on. 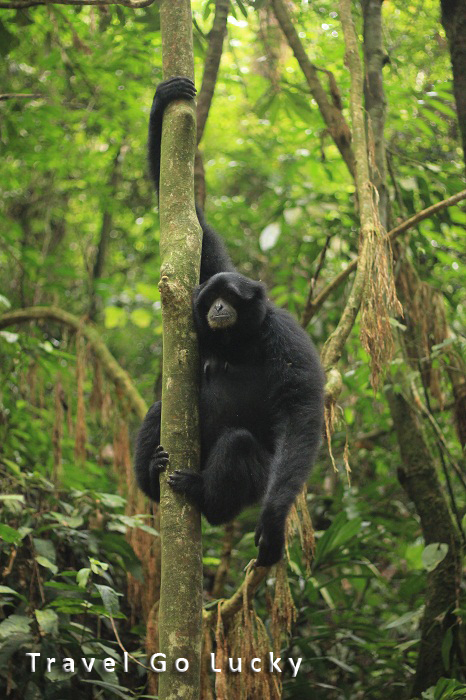 The endangered black gibbon... check out those long arms! During the last hour of our hike it started to pour, who would have guessed being in a rainforest. Not only were we slipping and sliding before the rain, but now we were really challenged to grasp our footing while descending on a very steep mountain side. We finally reached our campsite drenched from head to toe. It was made of large sticks from the jungle all tied together and a tarp covering the floor and making a roof. Other than camping for those 54 days on our Africa trip this would be the most rugged sleeping conditions we had in a while. 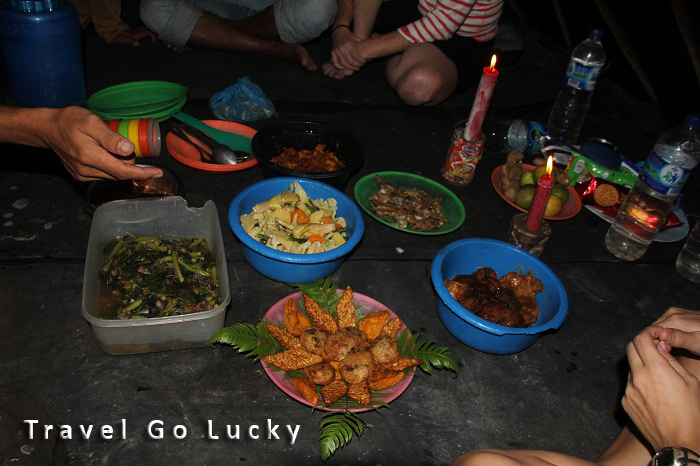 Our guides started getting dinner together for us while we hung out, rested, and swam in the river. Adam walked around taking some great shots of the scenery and came across a huge water monitor lizard right next to our tent, this thing had to have been at least four feet long. 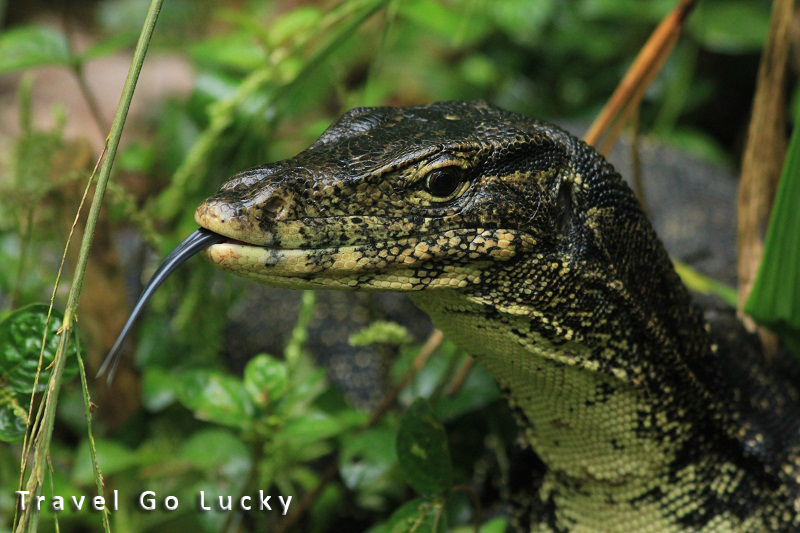 The monitor lizard is related to the komodo dragon. Dinner was delicious and consisted of small barbequed fish, rice, mixed veggies, and barbecued chicken. It was the best replacement Thanksgiving dinner ever. Later that evening Kembar was showing us some of his “black magic” aka card tricks. Adam happened to be the person chosen out of the crowd for all of his card tricks. We had a lot of laughs that evening. Right as we were about to call it a night, a huge storm rolled through, with lots of lightning and buckets of rain. I was nervous that the tent wouldn’t hold up against the pounding rain, but it worked out and we survived. I find it so funny that I was worried about being rained on that it never occurred to me that we were in an open tent and that any kind animal or insect could try to use our shelter as refuge from the heavy rainfall. We started falling asleep one by one, exhausted from the long strenuous hike. We woke up the next morning refreshed and surprisingly not sore from sleeping on the hard ground, ate breakfast, and started breaking down camp. Our guides put together three large truck tire inner tubes and tied them together. We packed our backpacks and cameras into dry bags and headed down the rapids. Our cook Ahmed was navigating the raft with a long stick he had found in the jungle earlier that morning. He was using it to prevent us from crashing into the sides of the cliffs and direct us, we had so much fun. When we reached the end of the river tour we were dropped right in front of our guest house. Now that is service! What a perfect end to our Thanksgiving travels. 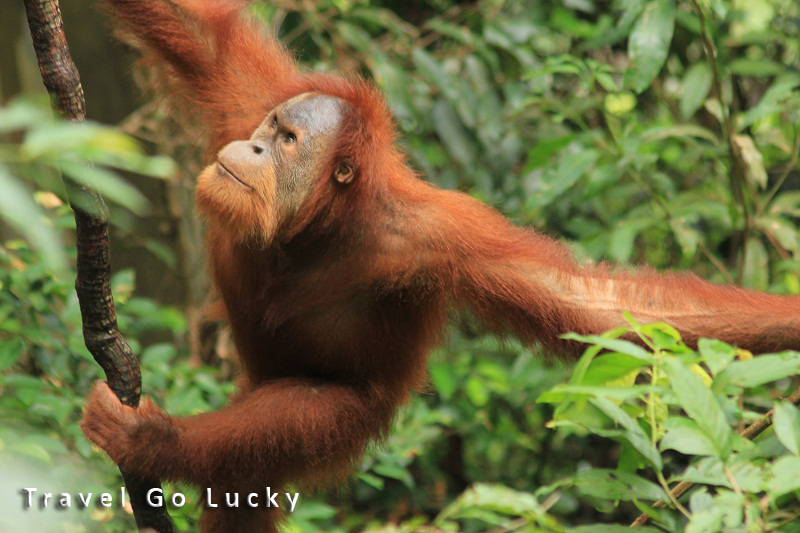 This entry was posted in Indonesia and tagged Indonesia, Jungle, Orangutans, Rainforest, Sumatra. Bookmark the permalink. 2 Responses to Welcome to the JUNGLE! That rainforest sounds awesome. Do you have more pics of the monitor lizard? So relieving to see those primates live freely in their true habitat. I hope it lasts for centuries to come.